Fried mushrooms are crispy on the outside, tender and juicy on the inside. It is remarkable how frying turns mushrooms into a fun snack or appetizer. Both wild or cultivated mushroom varieties work equally well in this recipe. Be sure to clean wild morels thoroughly since their sponge-like texture tends to hold plenty of what we'll politely call grit from the forest floor. You may want to cut larger mushrooms into one-bite pieces, but that's a matter of taste. 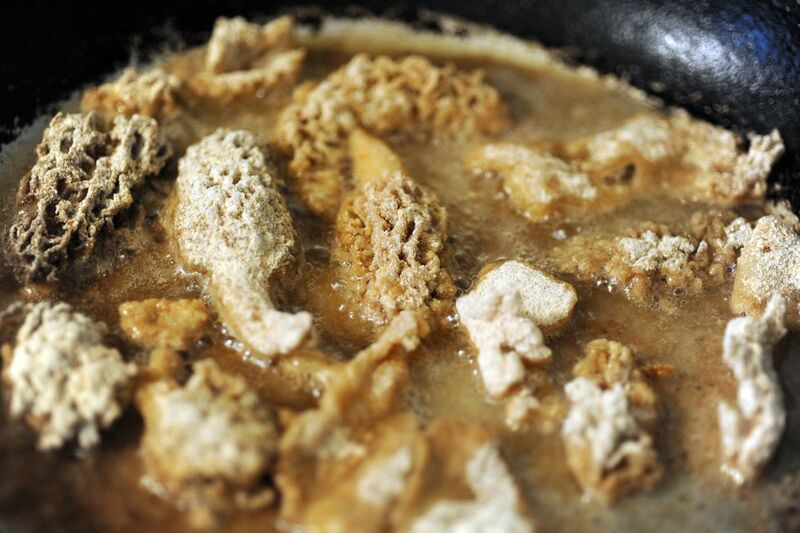 Whereas most fried mushroom recipes use a batter to coat the fungi, this recipe keeps things simple and ultra-easy with a quick dip in buttermilk and then a light dredge in seasoned flour, just like the best fried chicken. This is as much a method as it is a recipe, so feel free to make larger or smaller batches as befits your audience. Trim, rinse, and thoroughly dry the mushrooms. Cut into pieces if desired. Put the mushrooms in a medium bowl, pour the buttermilk over them, and toss them with the buttermilk to coat. Set aside. Bring about 1/2-inch of oil in a wide, heavy pot to 350 F to 375 F over high heat. Adjust the heat to maintain that temperature range. It's best to test the temperature by using a thermometer, but dipping the handle of a wooden spoon into the oil works too. If the oil immediately bubbles around the handle, it is hot enough to fry the mushrooms; if it doesn't bubble right away, it's not hot enough; if it bubbles quickly and violently, the oil is too hot. While the oil heats, combine the flour and salt in a large bowl or re-sealable plastic bag. Drain the mushrooms or lift them out of the buttermilk. Toss them gently in the flour mixture to coat them thoroughly. Shake any excess flour off the mushrooms as you lift them out of the flour. Add enough mushrooms to the oil to form a single layer. The single-layer bit is key: if the mushrooms are too crowded and not free to bob around in the hot oil a bit, instead of cooking evenly and turning golden and crunchy, bits will remain soggy and get oily. Fry until they turn golden to medium brown and the mushrooms are tender all the way through - about 3 minutes. Transfer the mushrooms with tongs or a slotted spoon to a cooling rack set over paper towels and sprinkle with more salt (if you're a salt lover, consider using big crystals of crunchy sea salt at this point) and serve hot. Repeat with remaining mushrooms, only cooking as many as can fit in a single layer in the oil at a time. You can serve your mushrooms with the dip or condiment of your choice. A horseradish dip or chipotle dip goes well with mushrooms.